With the “voice of a black woman,” writing chops of a Nashville songwriter and the intrigue of an Asian-American growing up in suburban North Texas, Melissa Polinar hasn’t let her differences sway her. “Is that how the people at Warner/Chapell described you?” I asked, referencing her short stint with the publishing company at the age of 17. “Well not directly, but pretty much,” she laughed. Melissa Polinar live at The Chapel, San Francisco, CA. 9/15/16. Photo courtesy of Christian Ang. Polinar’s authenticity has always been her sweet spot. When she reached YouTube fame back in 2008 and 2009, it wasn’t for her covers that were sweeping the Internet landscape–it was for her raw, stripped down acoustic ballads she wrote herself. As I walked into the doors of The Chapel, a mortuary-turned-music venue in the heart of the Mission District in San Francisco last September 15th, it was no surprise that an eager crowd of young Asian-American listeners lined the doors. 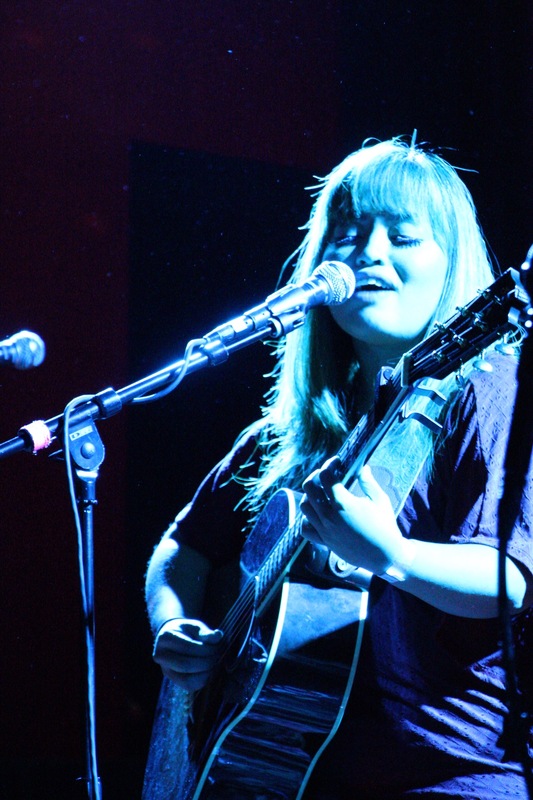 As Polinar’s first “proper” show in the Bay Area for quite some time (apart from school organizations and benefit shows), Polinar was glad to have fellow musician friends Justin Kawika Young and Gabe Bondoc share the stage with her. I sat down with Polinar and asked about her early upbringing, from music to YouTube to recording her upcoming EP. Rachel Ann Cauilan: So what can you tell me about yourself? Where are you from? Where’d you grow up? 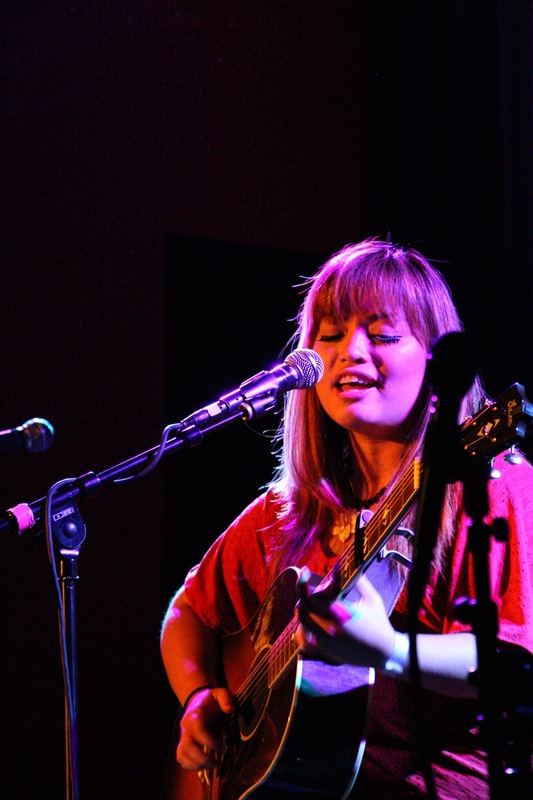 Melissa Polinar: It seems like a mystery to a lot of people but I’m from Texas … I grew up in Texas where there’s not much of a music community. There is a music community in church but in terms of industry or people who do it for a living, I found that in Los Angeles. RAC: How did you decide for you three [Melissa, Justin and Gabe] to take on this show? MP: All three of us have mutual respect for each other as musicians. I don’t want to take credit but I kind of put things together in terms of The Chapel … Justin reached out to me previously and wanted to do a few shows with me, so we’re doing this show, one in Los Angeles and one in San Diego just for fun. The moment we booked The Chapel, I immediately thought of Gabe because he and I had a previous conversation on how it’s kind of interesting how he’s somewhat of a local guy but he hasn’t really played around the area … So it’s not about ego, who’s headlining, who’s not headlining, who’s opening. It’s just a bunch of friends getting together. 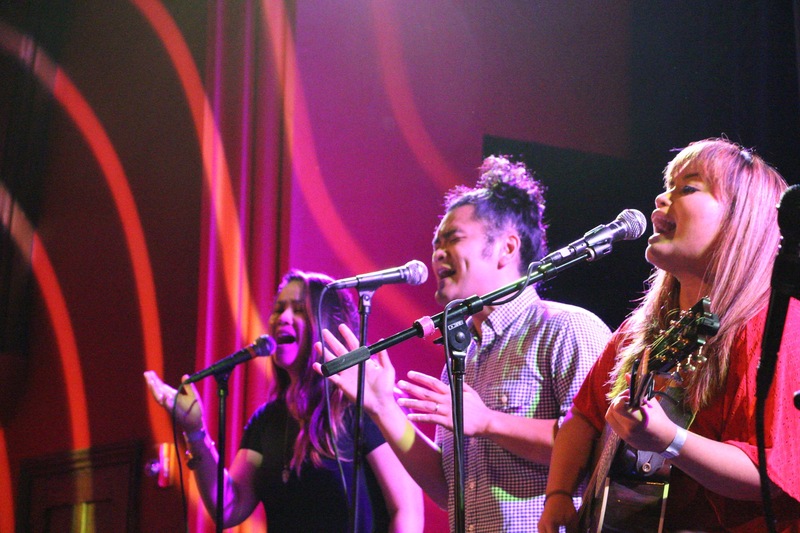 Nessa Rica Ramos, Gabe Bondoc and Melissa Polinar live at The Chapel, San Francisco, CA. 9/15/16. Photo courtesy of Christian Ang. RAC: That’s the way it should be! So I know you do have a new EP coming out. How long have you been working on that? MP: Yes! I would say the top of the year, kind of low key. I didn’t really know how it was going to look–if it was going to be an EP or something I would release the following year. I just went back and forth in the studio with Jesse [Barrera] and said, you know, let’s do something. RAC: How did you link up with Jesse? MP: We’ve known each other for a long time. We actually recorded my first recordings with him … We have this cool family relationship, he’s like a brother, and I’m just really comfortable with him. As of right now he is doing the mixing and post-production [of the EP]. However I’m still in the middle of raising funds for this [on PledgeMusic] which, as an independent musician, is what I don’t enjoy as much … As an independent artist, you have to find a way outside of a record label [to fund you], because if you do sign, there is that risk that they own you. RAC: They have all of the creative say, in a way? MP: A lot of it. Because they have the monetary means to market it. So if they don’t like what you do, they won’t market your music. In a way it’s one of those “unofficial rules”–they won’t say they own you but technically they do. MP: So that’s the thing with doing things independently. It’s so much harder. I wish I could pump out three more albums and three more projects to everybody who’s been following me through the years, but it’s just hard logistically, in terms of writing the songs, to producing it, to having musicians in there, to putting the package together, to having people put it out. … Hopefully the fans and friends and family will show up and support this record. RAC: I know you are Filipino-American. Has that affected you growing up? I know there’s that cliche thing where parents want us to be doctors and nurses. Did that ever happen to you? RAC: How did you go about doing that? MP: It’s the funniest thing. I grew up very musical and was kind of stereotypically Filipino where you’d take lessons. I took violin lessons, I took a little bit of piano, I was in choir, I was in band, I was in orchestra. I was pretty much like a geek. There’s nothing cool about it. I did it just because of the love for it. I think at the back of my head I never thought this would be my career. I always thought maybe I’ll go into medical field like most Filipinos. I actually thought of going into architecture because my dad’s side of the family is more engineers and architects. And I was not bad at math–so against popular stereotypes, some musicians like math! By the time I was in high school, that’s when I decided I should go and do music because I landed a publishing deal with Warner/Chappell. RAC: Oh wow. How did that happen? MP: In high school I would play gigs just for fun over the summer. I was kind of adventurous in that I would go out and play. This particular gig was in Colorado. … Apparently a guy from Warner Music Group was there [and] long story short, I got a songwriting deal as a teenager with Warner/Chappell Music. That kind of opened the doors for me in terms of–whoa–this is something that is a career. I never really expanded my territory that way before then. And from then on I started writing songs with a lot of professional songwriters and producers in Nashville. And that was kind of like my crash course into writing songs. When my deal with [Warner/Chappell] as a songwriter ended, I went back to Texas and thought, maybe I should go back to college. I went back to college and started taking classes and a friend suggested, “Hey, while you’re doing your thing and can’t fly out and do shows, post a few videos on YouTube.” And I guess that’s how everybody today discovered me. And that led to more LA opportunities. RAC: So when you were with Warner did you make a record with them? RAC: Hahaha, oh my gosh. Is that what they would say? MP: Well indirectly, but pretty much! At the end of the day they didn’t know how to market me. They were so intrigued but they didn’t know how to market me. That whole era of my life made me the writer that I am and made me the musician that I am and I think that’s the reason I picked up the guitar. When the YouTube thing came about a lot of people said I should cover more songs, but because of my experience in Nashville I was more motivated to do my stuff and present that instead. I guess the sacrifice is that I didn’t have a kabillion-jillion views. RAC: How do you think that affected you? MP: I guess in the long road, it gave me enough traction to get to the next step. Now I get to work with people like India.Arie, David Ryan Harris, Adam Levy [who plays guitar on her record] and people like Justin. I look back and think back on everything and it’s all from scratch. I wasn’t raised with my parents being, “Oh, be in the music industry!” They were thinking I would end up being a nurse or something in the medical field, which I wasn’t even opposed to. … I just took on opportunities in a way like a free spirit, which is against everything you’re being taught! RAC: So I know you’ve had lots of years of experience in the industry. What would you say is one of the most valuable things you’ve learned throughout this whole journey? Like, how do you keep your cool in the industry? MP: I don’t necessarily know if I keep my cool in the industry, haha! I think what it is that I’ve gotten better at or got used to is when the industry doesn’t go your way, I just always look for the good thing that is happening for me. If it’s playing for the Fil-Am community or the Asian-Am community or a small group of people in LA, I will keep cultivating that and enjoy it. What I wish I would’ve learned early on is to always surround yourself with good people. Not people who will hype you up necessarily, but just people who genuinely love you, not because you’re this persona. RAC: Have you had weird experiences with that in the past? MP: Well, at the end of the day, you still have bad days and you don’t turn to industry people for help. You turn to people that you trust, who care about you. I think when you’re involved in the industry sometimes, a lot of people just have only industry relationships, which is a hard thing because you still have to cope with everyday life. You’re still a daughter, you’re still a brother, sister, cousin, significant other. There’s relationships that you still have to cultivate and develop and care for. There’s a lot of things I could tell people, but to keep at it is definitely one thing. If you look back in history, a lot of the greatest artists out there kind of stick to their guns and just do it no matter how popular or not popular they are … If there are any young artists out there who want to do it, just be authentic. And you have to have a purpose in why you are authentic. Like, why are you being honest? RAC: Do you have anything else you want to say–about your EP or to the community, world, universe? MP: I always just kind of hope I can inspire other people to be whoever they want to be, whether it be in music or otherwise. I want to keep doing this because I want to make this my career and pay my bills and all that, but in the bigger scheme of things, I want to do it because I want to inspire people. As Melissa went on to play, she was all smiles as the crowd grooved, swayed and sang back every lyric to her stripped-down, soulful tunes. If there’s one thing I’ve learned about Melissa, it’s that she genuinely cares for and believes in the power of music. And if her performance was any testament to her growing musicianship, we’ve got a lot to look forward to. Polinar’s upcoming EP is set to release late 2016. Help her finish her goal and support her in the last 18 days of her PledgeMusic campaign (http://www.pledgemusic.com/projects/mpolinar).